In this oft-visited post about my hip and lower back “weak link”, I share go-to core yoga practices that are generally accessbile and effective for strength, stability, and flexibility-of the body and the mind. Here are three more core practices offered frequently in class and as reminders for your home practice. Our friends at Canyon Ranch list the many benefits of a strong core. I particularly focus on the benefits of core strength AND flexibility (flexibility is a special focus of yoga, of course) for balance and activities of everyday living. These include getting in and out of cars and chairs, lifting babies, and fall prevention. Remember, this is yoga: breathe, notice, pause, observe, and learn. The strong , majestic, and calm great Sphinx of Giza .The iconic Egyptian Sphinx is a powerful human-headed lion that may conjure visions of both strength and ease as well as a contemplative energy. Gently extends the spine, counteracting technology related shlumping. Helps draw attention to our breath at the chest and collarbones, and serves to bring room to the tissues in that area. 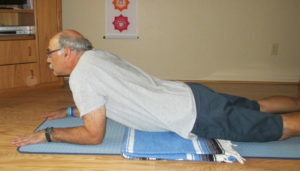 Note: My teacher Chris Coniaris’ teacher Dr. Shankaranarayana Jois teaches pranayama using Sphinx pose. Great backbend in it’s own right, or to ready the spine for deeper backbends. Notice the optional blanket under Norm’s hips. Breathe into the chest. Feel the movement of the breath at the belly. 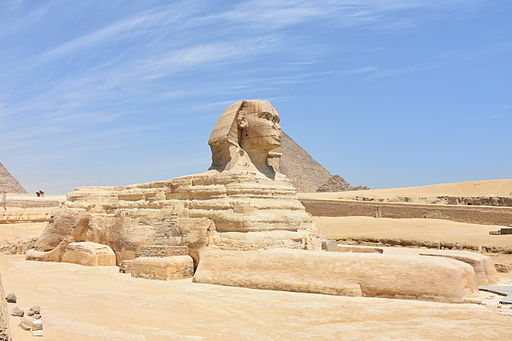 Norm gamely agreed to model a chin jutting, shoulder scrunching, non-relaxing version of sphinx. Legs resting version; use core strength to move legs to opposite side. Palms are down in this version. Left and right side of hips are aligned; as much as any body allows. Feel the belly move opposite the legs. Notice how the upper body opens. In a core challenge variation, the legs HOVER and do not land on the floor. Use core strength to slowly rotate legs to second side. Repeat slowly 4-6 times to each side. The blanket rest for the knee and ankle joints helps support those for whom it is challenging for the legs to reach the floor. As we wind down a practice one can often hear the audible sighs of release as this twist is performed. The yogis believe that twists physically and emotionally wring out accumulated tension from our being so that fresh perspective as well as fluids can be welcomed into our system. Additionally, this twist can be performed as core strengthener. The obliques (side muscles of the waist) are lengthened and strengthened. The chest muscles, primarily the pectoralis experience a refreshing opening. Once strength is built up, variations are many can include top or both legs straight. * Yoga for Osteoporosis, by Dr. Loren Fishman MD, and Ellen Saltonstall WW Norton, 2010. Stimulates the muscles along the back vertebrae called the spinal extensors, the rectus abdominus must work as well as the obliques. Begin prone on the mat. A block can be utilized between the hands to help maintain alignment. The thumb and pointer finger form an “L” shape at the corner of the block. As if slowly peeling a piece of tape off of a wrapped package, keeping hips stable, exhale, peel the belly off the floor. 4. If you are able, next, peel the hips. Variation Two: Peel hips off the floor. Knees and legs are still on the ground. Breathing! Next step: come to class and be motivated through all of your layers of being: to the core! * Seek the advice of a medical professional who can examine you personally for a diagnosis if you are unsure if these exercises are appropriate for you or make your symptoms worse.